Hegel is notable for his distinctive contribution to the perennial concerns of political philosophy. He outlines a powerful account of freedom as both a personal and social achievement, discussing theories of personal rights, private property and punishment. He articulates a social analysis of human action and criticizes Kantian ethics. His theory of self-actualization locates our social identitie… s within 'Ethical Life' - the institutions of family life, civil society and the state - expressing a unique variety of rationalist conservatism. 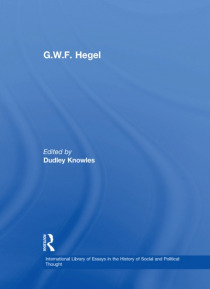 In this volume some of the finest interpreters of Hegel writing in English explore this distinguished heritage and explain its contemporary relevance.